Turbot is a large, saltwater flatfish known for its firm, white flesh and delicate flavor. From the Scophthalmidae family, the Turbot is found in shallow waters of the Mediterranean, North Atlantic and Baltic Sea. What kind of fish is turbot? Many members of the flatfish family, including Turbot, have eyes on the left side of their head and are easily recognised by their disk-shape body. Some have been recorded to grow up to 39 inches long and weighing up to 55lb. Turbot has a scale-less body is covered in bone-like knobs, formally known as ‘tubercles’ and is able to change colour from sand to grey depending on the sea bed. Where can turbot be found? Currently farmed in countries including Bulgaria, France, Spain and Portugal, Turbot is one of the most highly prized fish species, having held an honorable status in Europe for around two thousand years. Due to a high amount of unsustainable Turbot fishing, farmed Turbot is recommended the best choice. Some lower quality species of flatfish are often named as European Turbot, including West Coast flounders and Greenland Turbot. They have less flavour and softer flesh in comparison to real Turbot. 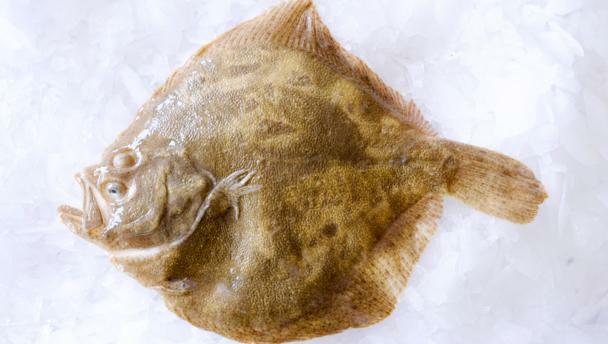 To ensure the best quality of Turbot before buying, when touched, it should feel firm and free of any unpleasant odours. The fins should be in good condition, the fish’s eyes should be clear, and its gills should still be bright red. How do you cook turbot? Available year-round for purchase (either as a whole fish, in fillets or steaks) dry-heat methods of cooking such as baking, roasting, grilling and pan-frying are recommended for a flavoursome finish, but should be approached cautiously. By using the whole fish, the bones help to add flavour to the flesh. However, It’s advised to avoid Turbot if the flesh has a hint of blue, as this means it's stale. Other methods such as wet-heat cooking are sometimes preferred due to the delicacy of the Turbot. These can include poaching, steaming or cooking en papillote. To check if Turbot is cooked, insert a sharp knife in the thickest part of flesh. If it's cooked through, then the knife will come out hot and the flesh should also feel springy. To then complement the fish, go for light sauces, such as a hollandaise or a herby sauce such as parsley or dill. The limited global supply and the popularity of Turbot means it’s not a cheap option, but will make for an exquisite meal.